Have you ever been told or asked these questions??? I think this stats is enough to explain the Secured Website need and you cannot ditch from the fact, that the very concept of the secured website does really attract millions of hearts and encourage the users further to proceed further with the app development part, but do we really understand what lies behind this security game for your website. Lemme take you on an excursion to help you understand it deeply. Well, on the serious front this one addition of S in HTTP changes the table around and this one alphabet makes your website becomes strong, secured and protected than ever before. Let’s dig out more about HTTPS? As I mentioned above the HTTPS is a way to secure and encrypt the information on your website portal, which you share between a browser and a web server. In the current era, expecting the security from personal data is an expected aspect. With the integration of HTTPS, you allow your website to get protected from the malware attacks or any cyber security breach. The secured URLs clearly indicate that the information transmitted from the browser to the server can never be violated by the hackers. Although SSL certificates are more fruitful for the eCommerce business portals, wherein the clients’ payment details have to be protected to process the transaction, but other businesses as well must adopt it in order to keep their data and information safe and secure. The need of the hour, which seeks the information to be fully protected has set a standard for all the websites to imply the HTTPS in their URLs. But then what is SSL certificate? Basically, an SSL Certificate is a set of data files which can be added to the web server to attain the encrypted connection between a browser and the server. On accessing your website after the SSL certification, users can see the ‘Green-Lock’ just before the mention of Secure written on your URL in address bar. An SSL certificate is a service or you can call it a product, which is purchased to be installed on the server and HTTPS is the result after getting the SSL certificate. On the other hand, I have been questioned many times, that is there any other ways through which SSL certificate can really be helpful, except the security factor? I think it proves further what I meant to say, Google has set its preference to a secured platform and hence they allow the HTTPS sites to get a ranked faster on the first search result page. Once your website comes on the very first page of the Google, I don’t need to mention, but this leads to higher ranking and SEO search results get affected hugely. A research suggests that users prefer to spend their money on the websites which provide the Secure connection button in the URL, despite having no information about the HTTPS or SSL. This Secure button works on the users’ buying decisions and helps them to provide their personal information fearlessly. You cannot deny is something shows Not Secure, you instantly take a step backward and feel hesitant to share your personal information. Hence by integrating the SSL certification, you allow your leads to get converted into loyal customers and consequently boost your revenue goal. When users visit the website, the very first expectation after the convenience is the security, which goes deep thrown down, after seeing the ‘Not Secure’ mention in the website URL. This leads many users to abandon the website in between since they find it inappropriate for their required set of services. In this wake, if your website offers the Secured connection to the users, it would definitely encourage the users to access your website, where they find the information safe enough. 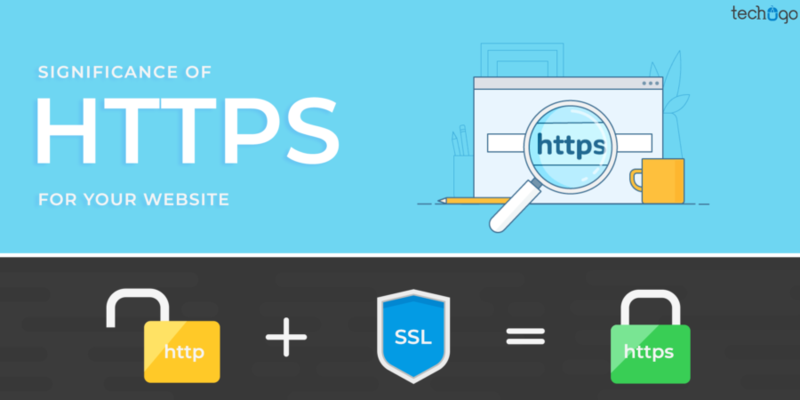 The worth of HTTPS is beyond the mentioned benefits, since there is much more, which helps your website and your business to receive the ample of advantages. The labeling from Google makes a difference in the presence of a business, and it is a worthy point to be taken care of. As of now for the HTTP website, Google simply mark them with a gray information symbol, which depicts the information further on being clicked. But this labeling is going to be changed, wherein Google would directly mention the Not Secure label in the plain site with a red triangle. This step would eventually hamper your business’s branding identity largely and you would certainly experience the depletion in your business revenue growth. When you decide to proceed with the HTTPS connection for your business website, then you take the authority in your hand to monitor and access the data transmitted and it turns into seamless and protected bridge for the users to share details, without any hassle. Now if you are wondering how to give security shot to your website, then no need to worry, you need to get in touch with the experienced web development team of a top web development company – Techugo, to help your website development process turn more safe and secure by attaining the SSL certification with an ease.